In Western tradition, a dinner guest brings a bottle of wine as a host or hostess gift. In India, Cadbury wants to make Toblerone the gift to give – it’s a strategy for growing the chocolate market in India. And it’s working. 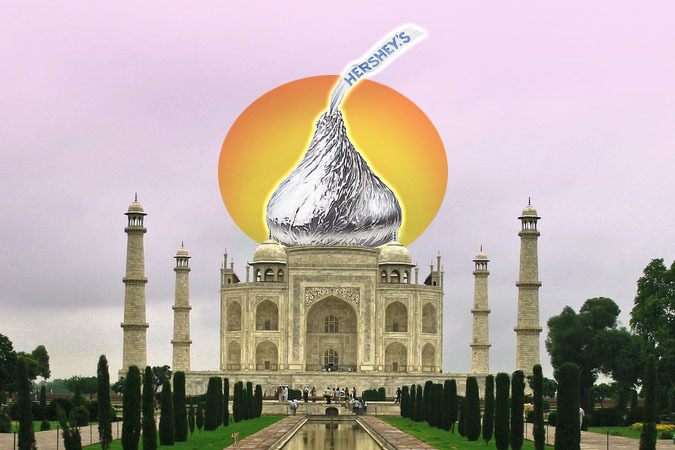 Hershey’s and other chocolate makers have also zeroed in on India, a subcontinent ready to be conquered. Cadbury’s Toblerone, with its distinctive triangular box, is the leading brand in airport duty free stores around the world. It’s considered a premium brand and Cadbury India (a division of Kraft Foods) is actively promoting it and its other premium brands, including Cadbury Silk, in India. In a nation where gifting is a solid tradition, chocolate gifting accounts for 6 percent of India’s gifting sales. The biggest brands: Hershey’s, Ferrero Rocher, Lindt, and Cadbury, which at 70 percent dominates India’s nascent chocolate market. So how much chocolate are we talking about? Between 2005 and 2012, India’s chocolate consumption tripled – meaning it jogged from 40 grams to about 160 grams person, or less than two 3.5-ounce chocolate bars. Undeniably, this is a meager amount. But international cocoa producers are on a mission to expand their product everywhere. And wherever sales are low, there’s room to grow. As incomes rise in India (and elsewhere), consumers tend to trade up, especially in food and grocery items. They start buying more expensive brands, and products with higher quality, better packaging, and distinctive branding. India has long had a love affair with sweets and gift-giving, and Indian-made chocolates do exist (Amul is the largest). But international mega-brands have aggressively pitched their chocolates as status-symbol gifts during Diwali, the Indian festival of light and the most important holiday of the year. People increasingly prefer pristinely packaged chocolates over the mithrai, traditional Indian sweets sold at shops and stands. And perhaps chocolate’s caffeine and theobromine content creates a chemically induced, feel-good habit that non-chocolate mithrai can’t provide. Diwali chocolate-gifting is now popular enough to spawn both counterfeit chocolate sales and luxury chocolate jewelry. Some of the Diwali woes: Fake chocolate sold under big name brands; chocolate adulterated with minerals to increase the weight and deepen color; and gravelly texture from inferior sugar. India’s newfound passion for chocolate has inspired spurious products. Luxury products also get a boost. One designer is selling chocolate jewelry, gilded with edible gold. Gold is the ultimate Indian status symbol, and with gold prices so high, gilded chocolate seems like a novel alternative. But whether gilded or not, chocolate is invading India, and no one seems to mind. Exactly how is chocolate made? The raw ingredient from the cacao tree undergoes several steps before becoming the luscious product sold as kisses, bonbons, and bars. 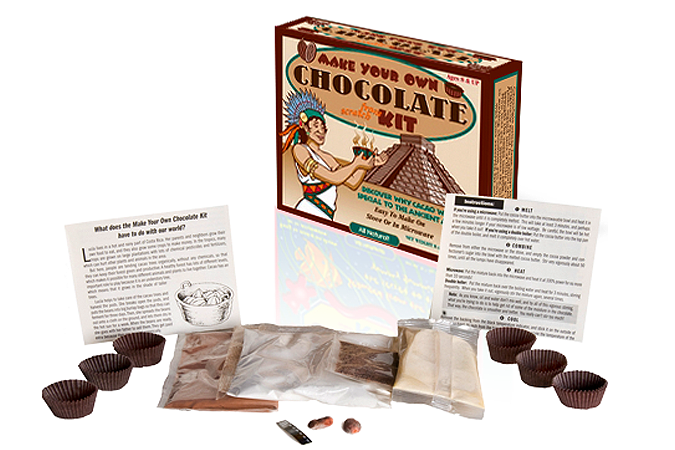 Now, kids and adults can experience part of the process with this Make Your Own Chocolate Kit. It contains simple instructions and packets for making eight ounces of dark chocolate on the stovetop or in the microwave. The kit skips the fundamental steps of harvesting and fermenting raw cacao beans, but you’ll get a good feel for what a chocolatier does. Created by the makers of Glee Gum, this DIY chocolate kit contains Fair Trade and organic cocoa butter, cocoa powder, confectioner’s sugar, starter crystals, a temperature indicator, paper candy liners, an educational story about the history of chocolate, plus a few cacao beans to nibble on. Melt the cocoa butter, stir in the cocoa powder and sugar, let cool to the right temperature, and temper the chocolate with the starter crystals. Voila! Homemade chocolate. The Make Your Own Chocolate Kit retails for $13.95; it’s sold at gift stores and online at GleeGum.com. By the way, if you’re keen on serious chocolate making, dive into Navitas Naturals selection of cacao products. They sell organic premium cocoa butter, cocoa powder, cacao beans (whole), and nibs (more details in a future post, but for now, explore Cacao under the Products menu at NavitasNaturals.com).